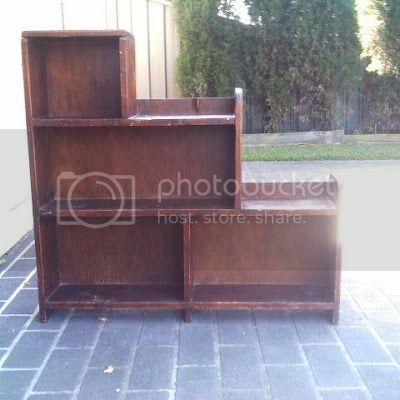 I've picked up a few great pieces this week, ready for makeover. I've learned my lesson after last months market day - I need to get in early and finish more pieces than I think I need, in case I sell a few during the month. No more last minute freaking out moments please! 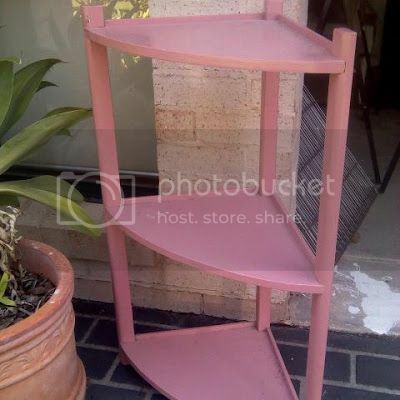 These corner shelves are slightly too pink for my liking, but I think they'd be great with a makeover. I'm torn between going with a bold colour (like yellow) or something more subdued. Stay tuned. I also picked these tiered shelves up this week. I was a little disappointed to see that part of the wood was damaged (which was not noted on the add, nor mentioned when I asked), but I decided to take them anyway and see what I can do. Again, these are still in the 'thinking' stage - I'm tossing up whether to remove the back and cover with fabric or wallpaper, or just remove it all together. We'll see. The last one is something I picked up just last night. I drove passed it and knowing I couldn't cram it in to my car, raced home to swap cars and cross my fingers it was still there. Lucky for me it was. I love that it has three legs - at first I thought one was missing and that it was leaning on something else, but no, it's curved round at the end to just one leg and that's just cool. Lots of thinking going on about this one too. 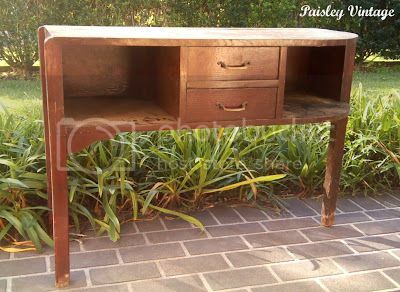 I think it would lovely white, distressed with glass pulls. So, what about you? Had any great finds lately? Ooh that last one is really unique! Can't wati to see what you do with that...so many options! Have fun!! ooh that last piece is so fun and different! love its shape and can't wait to see what you do! Drives me crazy when you go to pick something up and its not great condition like they say. Great finds though, that last one is very cool. Looking forward to seeing the after of that one. wowsers Catherine you find the best stuff on the side of the road! How's that stress level of spotting something and not being able to grab it straight away, lol, my heart races and I cannot concentrate on anything else till I get back and stake my claim, haha! I just got a great corner hutch yesterday, it's my special project piece...can't wait to get stuck into it! Bar stools - a gaggle? a flock? maybe a pub full?